Natalie joined TfGM back in January 2013 as an apprentice in the Customer Relations team after looking at potential alternatives to university. 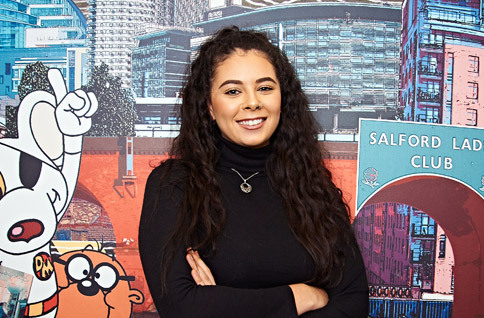 Natalie says: “I didn’t really know what I wanted to do after finishing school so being able to join TfGM, as a 16 year-old, as part of the first apprentice scheme was a great opportunity. To start with, I didn’t know what to expect because it’s such a big organisation. I’d never had a full time job previously”. Natalie’s role changed at the end of her first year as the Customer Relations team became part of a Customer Contact Centre and Natalie became a Customer Support Officer – handling calls from public – whilst still having regular meetings with her tutor to ensure she was getting the most out of her role to achieve her Customer Service NVQ levels two and three. Following the completion of her apprenticeship, she was offered a permanent position early in 2015. During the summer, she then saw an opportunity to apply for a Customer Engagement Officer which was advertised. When considering whether to apply for a new role, Natalie adds: “I had already worked as an assistant in Customer Relations, prior to taking up my role as Customer Support Officer, so I knew a lot about the job and the team already. After a fruitful 18 months within Customer Engagement, Natalie applied for a 12-month secondment as Service Planning Booking Scheduling & Dispatch Specialist in the Bus Services team in summer 2017. Commenting on her change in career, Natalie says: “I wanted a change in career as I had been in the same area of the organisation since I started. I had really enjoyed my time in the Customer Engagement team and felt I knew the job inside out, so the chance to apply for a new role was an avenue I was keen to explore”. Once again, Natalie was successful and transitioned to her new team in August. Natalie concludes: “I am really enjoying it, it’s a massive challenge and every day is different but having the opportunity to work on long term projects is really satisfying. It’s a different environment to what I am used to. TfGM has opened a lot of doors for me with the two NVQ qualifications and the on the job experience it has provided. “Having those transferrable skills, including problem solving and analytical thinking is a real asset. I would never have been able to apply for my current role if it wasn’t for the level of experience I had built up previously within the organisation”.